Cincinnati, Ohio : St. Anthony Messenger Press, c2006. viii, 246 p. ; 22 cm. 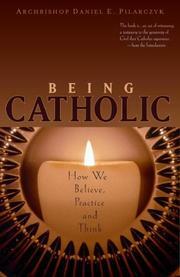 Being Catholic : how we believe, practice, and think / Daniel E. Pilarczyk. 100 ME:PersonalName 1 $a Personal name Pilarczyk, Daniel E.
$c Statement of responsibility Daniel E. Pilarczyk. 505 ContentsNote 0 $a Formatted contents note Believing Catholic -- Practicing Catholic -- Thinking Catholic. $x General subdivision Catholic Church.